Congratulations on finally conceiving the idea of creating a product that will change the game, but sorry to rain on your parade ─ you’re not quite done yet. Now you have to equally consider creating some forward-thinking packaging ideas to go along with it. The primary reason for packaging is for protection. No matter how beautiful the design is, it’s all for nothing if the product it’s supposed to house is still vulnerable to the slightest physical damage. It usually costs far more to replace damaged goods later than to develop durable tamper-free packaging options from the get-go. Packaging is like a window into your product’s soul. The design is what attracts buyers to its position on the shelf, and what leaves an impression on them. The trick is to leave a lasting positive impression from the outside to the inside: similar to looking into a window. Impulse buying is a thing among shoppers, so you should aim to take advantage of this fact. The best packaging supplies like the ones on offer at Uboxes serve a purpose and easy to organize your move with color-coded tape or labels. 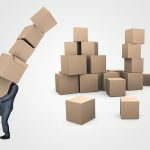 In addition to being durable, informative and attractive, you want to make sure your moving supplies are also cost-effective so as to reap the best possible profits. It is important to consider as many standard sizing ranges as possible to significantly reduce production costs and yield greater flexibility during transporting. But you should also remember that cheaper doesn’t always mean better. Sometimes spending slightly more for higher quality could protect your valuables such as the heavier corrugated kitchen boxes for your fine china. You want your customers to feel some sort of connection to the product. The trick to achieving this is to make your packaging as memorable as possible to emphasize your brand identity, which is as important as the product itself, especially when tailored to appeal to a specific target customer base. For more information, and if you need packaging for your product, please contact us. We will give attention to any questions you may have. At Uboxes, our design team will create something special for your brand!